Presently on a flight full of CES attendees to Las Vegas! Here’s an excerpt of the chapter I wrote for Storyteller Uprising ahead of CES. If you’re attending, see me, I’ll have a number of hard copies of the book on hand, plus business cards with the e-book download information. It’s this symbiotic relationship between storyteller and “the people formerly known as the audience” that speaks to the power of producing content through our own channels. It’s trust, it’s accountability, it’s often real-time and it’s highly responsive. And the ideas (from Occupy to Tea Party, Arab Spring to It Gets Better) carried by these highly accessible, highly democratized stories often propelled by seemingly leaderless movements are shaking the hierarchical, infrastructure-heavy systems we had become so inured to over the last six decades. This can only mean that we’re in for more change and uprisings, as the technology that transports these narratives becomes even more pervasive, portable, and cheap. This is no longer the stuff of science fiction. Serna dreams of innovations that will feed a highly interactive form of storytelling in the coming years. These devices will be readily available to consumers – inconspicuous, ubiquitous and highly sociable. So here’s my educated guess at what’s on the immediate horizon. Those Spartan (a couple of USB ports at most, no optical drive) ultrabooks, exemplified by the Macbook Air, point the way to near-pocketable powerful computing. But these thin and light laptops will be reserved for activities that require more processor-intensive activities (such as elaborate video editing). It’s the smartphone that will act as our personal computing hub, connected to other devices attached to our body: from wristwatches that show us the latest text message, to eyeglasses that “augment” our reality with graphical overlays and information (say as we tour an historical site), even as they capture video, to sensors in our clothing that detect our movement, measure our calories, distance and body heat. We will produce and consume real-time data that will drastically alter our awareness and actions, even as we untether ourselves from our desks. After all, we’ll no longer need keyboards, mice, or remote controls, thanks to voice navigation and motion detection. Wireless networks at home and in the office, along with cellular antennae and mobile hot spots were just the first steps to keeping us in a perpetual state of connection, irrespective of our location. But these technologies are either limited in distance or by bandwidth. Two developments – one certain, the other still in experimental stages – will erode these boundaries. The next frontier for network accessibility? The automotive industry. Manufacturers such as Ford and Mercedes are set to install Wi-Fi hot spots in their vehicles. Ostensibly, it begins as a safety feature: cars can now communicate with each other when they come into range, warning them off should they get too close for comfort. But once you establish a connection, there’s so much more that you can do with it. Tether your devices, dump your local radio station/stream your favorite online music service, uninstall those rear passenger DVD players/stream from your preferred video entertainment provider to your tablet, put aside that Bluetooth audio connection/stream your conversation (and your view) through Skype. Suddenly movements such as Occupy might have the equivalent of a TV satellite truck in a compact car that an activist say, borrows from her parents. And our increasingly bird’s-eye view of our world will now extend to the reach and mobility of the visuals that we can capture through our automobile. But where are we going to get the bandwidth for all of these new ways to consume data? We’re all too well aware of the congestion (and commensurate bandwidth caps) we’re experiencing on our broadband and cellular networks. A few caveats about white space: it exists in varying degrees depending on a city’s available spectrum. And true to form, the U.S. Congress is looking to raise money off of the auction of some of this spectrum (even as the FCC had already stated that it would be made available for unlicensed use). Still, access to this kind of connectivity would facilitate the distribution of expansive amounts of content (especially live, high definition video), potentially disrupting the business models of cellular and cable providers, providing new opportunity for widespread distribution of stories. At the height of TiVo’s popularity in North America, many of us were proclaiming the death of television. Time shifting through digital video recorders such as TiVo meant that viewers could skip over commercials and watch programs whenever they wanted. So why would advertisers want to pay such a heavy premium to broadcasters if no one was watching? But we forgot one thing. Television remains our electronic water cooler. People commune around the “happening” of a TV program. Our love affair with television content is still a lingua franca for popular culture, even as the Internet fragments everything else. And suddenly, there’s a new reason to watch TV in real time – so that we can interact with others in that same real time. It’s an attractive proposition for anyone who uses media as connective tissue because it presents the possibility of creating an immersive experience (a deep engagement with the ideas that underlie the content). An early indication of this was Barack Obama’s Presidential Inauguration in January 2009. CNN partnered with Facebook to stream the live event and facilitate conversations. According to Mashable.com, 4,000 people a minute were commenting on the Facebook CNN feed, with a total of 600,000 status updates. Suddenly, we have the marriage between traditionally passive medium of television and the sometimes hyperactive buzz of social media, enabled through the so-called “second screen” of computers, mobile devices and tablets. Even as we’re watching TV, we have an eye fixed on another screen. 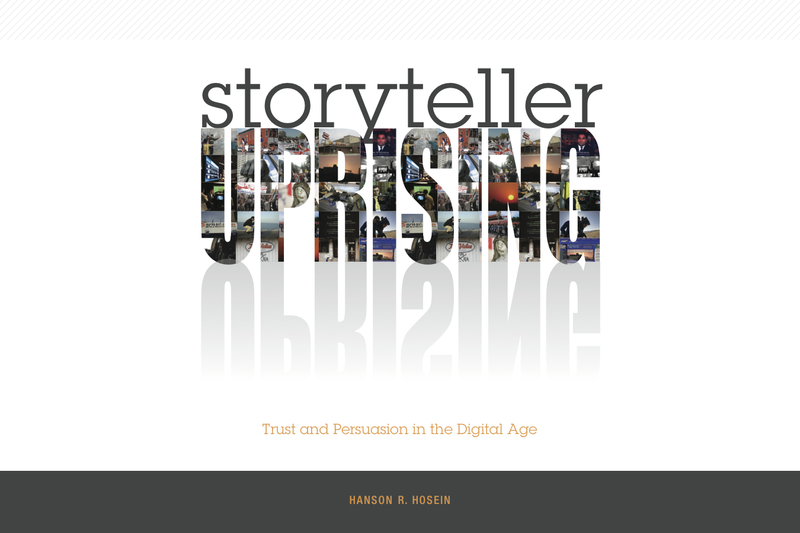 As we saw with the Occupy movement, those social interactions can have a profound impact on the live event itself (camera angles, interviews), which would emphasize the renewed interactivity between storyteller and community. We’ve been so used to qualifying those who watch TV as “audience” that it may take some courage to acknowledge that when audience members begin to truly engage with each other and the content that has given them common cause, they actually transform into a “community,” with common interests, shared values, mutually-agreed upon rules and a strong degree of trust. My students led me to this important progression of audience to community after I had assigned them to produce a blog and build “community” around it (which happens to be the premise of this book). But as several of them pointed out, “community” isn’t readily created. It takes time, work, and a degree of self-identification with a common cause. So, yes, I must admit that once you establish your narrative Action Idea, it’s helpful to then ask, “who is your audience?” (a broader, more passive and established entity). Later you can determine whether the stories that you tell might inspire a deeper form of audience loyalty leading to the social cohesion of community. Once you have catalyzed that kind of commitment, then convincing your followers to engage in some form of transformation – be it behavioral change or a wholesale uprising – becomes that more probable. So what could this mean for the Lorenzo Sernas of the near future? They’ll be even more inconspicuous with cameras integrated into their eyeglasses or somewhere in their clothing, recording the footage remotely on a smartphone hidden away comfortably in their pocket. From the ground, they’ll control an inexpensive drone helicopter overhead, capturing 3D aerials of the scene (because 3D by then will have proven itself to be an essential element of that immersive “you are there” experience). A production team will be stationed in a nearby car, taking in the various feeds thanks to the portable white space network they’ve created through an in-vehicle router, uploading them to an online streaming site. Passionate members of the viewing community will interact with the content and the production teams through traditional text conversations, as well as visual Google+-like “hangouts,” manipulated by voice and physical gestures. A third party organization will capture these multiple streams and multiplicity of interactions, repackaging them and broadcasting them to an even larger audience on more mainstream social media and television channels. In the aggregate, this powerful story will have the production values of a Hollywood blockbuster, the impactful intimacy of a weekly gathering in a small town church, and the social consequence of history being made, discussed, recorded and transmitted – all in real time. This is no “brave new world,” it is a very real media-driven uprising – coming soon to a street corner, marketplace and institution near you. Hanson, heard some of your comments on terrestrial radio (Geek wire). The above excerpt is intuitive to a high degree, in two spots you mention “value”; 1) to business, 2) to transformation, …..and value is probably the greatest lever for engaging in social media. Ubiquity of a medium for communication is valuable, what we’re engaging in right here, is a sort of peering fabric, around which social networks will continue to expand and develop. Bring value and you’ll have a following. Have a following and be an influencer. Carried to the next degree, on a local level, any one with a blog or a social platform, could be the hotspot or base station of the future, meaning that the spectrum is supplied by the content distributor, while the loyal army of mobile content consumers and contributors are the subscriber. Confusing? Talk to me about the imminent deployment of such networks! Yeah, I agree that this is largely intuitive. We could have even predicted this a few years back. What’s new however is that the technology, UI and critical mass among consumers are almost in synchronicity. Which means that we’ll finally see execution on the prediction into reality. Meanwhile, I’d love to hear more about the imminent deployment of the networks you mention!